On the back wall of the bedroom, a door leads to the lean-to (a room with a sloping roof.) 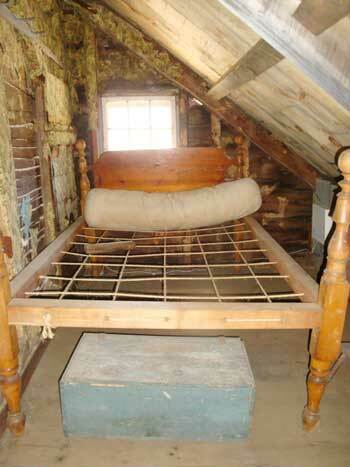 In this back room, older children would sleep on the rope bed. The ropes held a mattress, which was just a fitted sack stuffed with feathers or dried corn husks. The expression "sleep tight" comes from the rope beds. The ropes would sag with time and weight, and had to be tightened periodically with a wooden tool called a bed wrench.